You’re dressed to kill. You spent plenty of mirror-time perfecting your face. Then you step outside and BOOM – your seasonal allergies attack and you end up sneezing and with Allergy Face: a red nose, watery eyes and a puffy face – NOT attractive! Plus if you’re not feeling well your happiness and confidence can diminish – adding to the sad situation. How can you solve this dilemma? ZYRTEC® can help you feel better and the ALLERGY FACE™ beauty tips in this entertaining video can help you look better. Personally, when I’m suffering from seasonal allergies and fighting Allergy Face, the first thing I do is try to get lots of sleep. The last thing I need is to battle bags under the eye along with everything else. Plus, a good night’s sleep just makes me feel better in general. I also try to drink lots of water, but at the same time try to avoid too many salty foods so I don’t retain that water. I don’t want my face to be any puffier than it already is from allergies. Last of all, I am sure to use a good quality moisturizer to fight the drying out effects of using too many tissues while suffering from allergies. You can find more tips for fighting Allergy Face when you Check out Zyrtec on Facebook. Now, tell us, what are YOUR beauty tips for tackling ALLERGY FACE? This entry was posted in Uncategorized on September 16, 2013 by Chrysa. Ha! This is great… I take Zertec every day, but when my allergies cause sinus issues, my MIL says I get dark circles… HA! I have used Zyrtec for years – it’s been amazing when it comes to the summer sneezes thanks to hay fever as well. 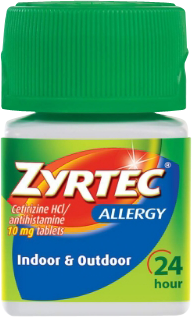 I cannot survive without Zyrtec. It’s such a life saver, especially here in the Dallas metro where my allergies go wild! I honestly used Zyrtec when I was pregnant and was able to get some relief!